Fusion Fest is the place to be! 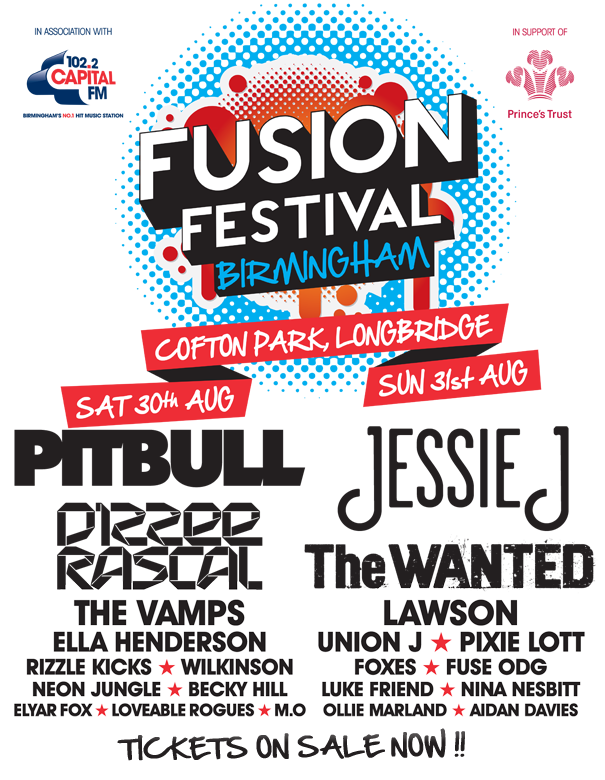 And we’ve reported TWICE already on the INCREDIBLE line-up for this years Fusion Festival in Birmingham! And we have news that another 5 acts have been ANNOUNCED! Fusion Festival is based at Cofton Park in Longbridge and promises to be an AMAZING show, which will be bigger and better than last year – which seems like a hard task, but this line-up is proving this statement to be true. With amazing acts like RIZZLE KICKS and M.O joining this year’s FANTASTIC headliners PITBULL and JESSIE J, the weekend looks to beat last years by miles! With performance’s from the incredible DIZZEE RASCAL, THE VAMPS, OLLIE MARLAND and PIXIE LOTT! and the newly announced bunch: RIZZLE KICKS, WILKINSON, M.O, NINA NESBITT and AIDAN DAVIES! We are unable to contain our EXCITEMENT! Tickets for this years Fusion Festival are CURRENTLY avaliable – With Weekend Tickets and Day Tickets available for everyone (VIP and Golden Circle Weekend & Sunday Tickets are now SOLD OUT!) – in support of the Prince’s Trust. So GET THEM WHILE YOU CAN! It’s back and still as incredible as always! That’s right people! It’s the BRUMOTIONS PLAYLIST OF THE WEEK! Featuring BOTH our own and YOUR favourite artists! 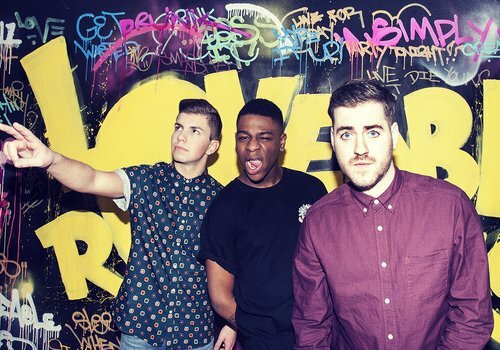 Including Loveable Rogues! Who a few of our Brumoters received the opportunity to see live during the FutureProof party at the Islington Academy in London! Check out the Playlist below! And don’t forget to suggest some tracks of your own to feature in our next playlist! What A Night with the Loveable Rogues! 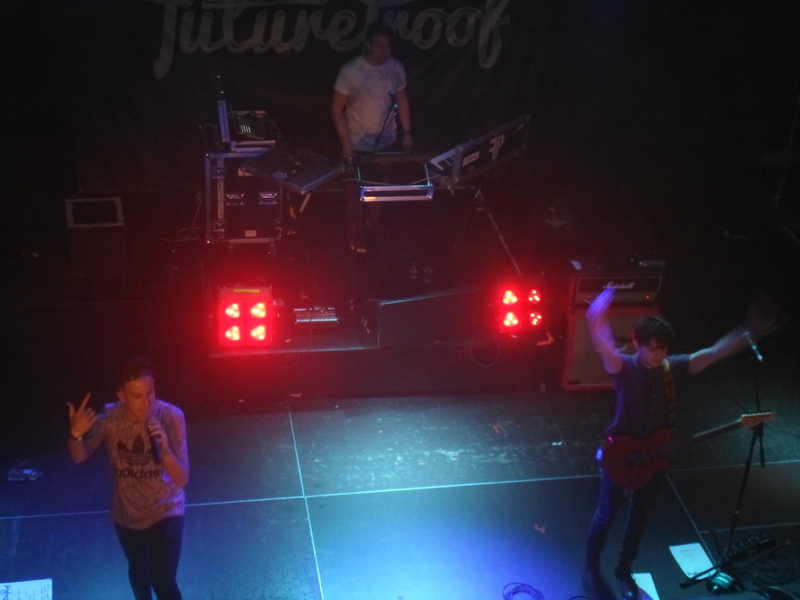 On June 1st, a large number of fans had travelled from across the UK to the FutureProof party at the Islington Academy in London, for which the incredible Loveable Rogues were the headline act! Joined by a large number of other acts, including FutureProof, Kingsland Road, In Hindsight, Canary Swing, Rewind and the Loveable Rogue’s friend Tich, the lads thoroughly impressed the packed crowd. Loveable Rogues, consisting of Sonny, Té and Eddie – more well known for coming in fourth place during their time on the sixth season of Britain’s Got Talent – entertained the crowd at the end of the afternoon with an incredible performance, which had both old and new fans singing and dancing along. It was obvious to see that the trio enjoy performing live and are very humble when listening to the fans singing their lyrics back to them and dancing along to their tunes. The group made sure to include fan favourites Love Sick and What A Night to their setlist, which gained the largest response from the crowd who waited through 4 hours of other performers to hear these guys play and it was well worth the wait! ‘Honest’ from the boys EP of the same name (which is currently available on ITunes!) also made an appearance on their impressive setlist. The alternative pop track is very catchy and those who weren’t fans of the lads previously were able to catch on and sing along with them. We definitely recommend that you see these boys live as their tracks are catchy and their live performance is impeccable! Brumotions gives their performance 5/5 Microphones! Why not watch the video of their performance of ‘What A Night’ from the gig on Sunday and let us know what you think! In Hindsight’s tunes are dangerously catchy! On June 1st, Midlands based pop/rock band In Hindsight joined the jam packed line-up for the FutureProof party at the Islington Academy in London, alongside FutureProof themselves, Kingsland Road, Jake Sims and Canary Swing with headliners Loveable Rogues, just to name a few. Two members of the band – Issac and Michael (as Daniel was revising for his exams… Good luck Daniel!) warmed up the audience with an exclusive acoustic set list as a preview of what’s to come on their own tour in July. The band performed an array of original songs including ‘Sweet Valentine’ and their next single ‘Dangerous’, which left fans screaming back the lyrics to the two ecstatic lads. They also performed many covers including Pharrell’s number one hit ‘Happy’ and Michael Jackson’s ‘Billy Jean’, which was a great addition to their set. We have previously seen the full three piece band and were impressed with their set, therefore we were slightly disappointed that we weren’t getting the full In Hindsight experience. However, even with the acoustic set, both Michael and Issac really impressed the audience and left many of them wanting to find out more about the group. Check out their new single ‘Dangerous’ below! And why not book tickets to see the group live on their UK tour in July with special guests Orchard Hill. Brumotions gives them 3/5 Microphones! In a huge send-off to a fellow band member, FutureProof performed a packed Gig/Party at the O2 Islington Academy in London and thoroughly entertained their ecstatic fans, along with other guests who were invited along to perform. FutureProof, consisting of Kiran, Jonni and their now, ex-bandmate Charles, who will be missed! (Left to Right) entertained the crowd in the middle of the gig – we suppose they wanted to party the rest of the night away to properly send Charlie off – which was well deserved after their incredible performance, which rounded off their UK tour! Joining FutureProof and performing throughout the afternoon were a number of amazing acts, such as Jake Sims, Canary Swing, Rewind, Tich, In Hindsight, Kingsland Road and the headliners of the party, Loveable Rogues! The bass-pop trio that is FutureProof shared their relentless energy and fantastic performance with the eager crowd – some of which had been queuing to see the group’s last gig with band-mate Charlie since 8am! The group made sure to include fan favourite’s ‘Good Vibes’, ‘Party Hard’ and ‘Everything’s Alright’ into their setlist, which obviously gained a positive response from the fans who proceeded to scream the lyrics back to the slightly emotional lads. Although Charlie has now officially left the group, Jonni and Kiran promised the fans that this will not be the last we see of the lads and we sure hope not! We definitely recommend that you see these boys on tour at your next given opportunity as they’re incredible live with a number of catchy tunes in their arsenal. Brumotions gives their performance 4/5 Microphones! Why not watch the video of their performance for ‘Everything’s Alright’ from the gig on Sunday and let us know what you think! And this week we have another 12 INCREDIBLE tracks! And as always, it features BOTH of our own and YOUR favourite artists!